This town, embracing its present limits, or township No. 3, of the Black River Tract, was taken April 1, 1802, from Watertown; the first town meeting being held at the house of David Coffeen. The first town officers chosen, were David Coffeen, supervisor; Jacob A. Williams, clerk; Abel Sherman,* (*Dr. Abel Sherman, the first sheriff, was a native of Brimfield, Mass. and removed to Clinton, Oneida County, from whence, in 1802, he settled in Rutland, on the south road, where he subsequently lived and died.) Zelotus Harvey, Wm. Coffeen, assessors; Levi Heath, Solomon Thompson, Gershom Tuttle, commissioners highways; Benj. Edde, constable and collector; besides two pound masters, three fence viewers, twelve path masters, three deer reeves, six hog reeves, and a committee of three to settle accounts with Watertown. Wolfe bounties of $10 were offered in 1803, 7, 8, 14, and of $15, in 1805-6. Fox bounties of $0.50, in 1816, and $1 in 1818. In 1811-12 a law was passed, requiring Canada thistles to be cut, “at the full moon in June, July, and August,” under a penalty of $1. Supervisors. -- 1803, David Coffeen; 1804-5, Clift French; 1806, Ethel Bronson; 1807, Zelotus Harvey; 1808, Hugh Henderson. At a special meeting in April, Ethel Bronson, to fill vacancy; 1809-13, Judah Williams. In July, 1813, Jonathan Smiley, to fill vacancy; 1814-20, J. Smiley; 1821-12, Ethel Bronson; 1824-26, Amos Stebbins; 1827-35, Joseph Graves; 1836, John Felt; 1837-40, Geo. White; 1841-42, Aaron W. Potter; 1843, J. Graves; 1844, David Howland; 1845, Gardner Towne; 1846-47, Merril Coburn; 1848-49, Asa Clark, Jr.; 1850-52, Martin L. Graves; 1853, John A. Sherman. The name of this town was selected at a town meeting, held for the purpose, and was suggested by settlers from Rutland, in Vermont. This town was surveyed by Benjamin Wright, in 1796, into 57 lots, of about 500 acres each, and in 1799 he subdivided these into quarters. The town having fell to the share of Wm. Henderson, in the division of the Black River Tract, was first opened for settlement by his agent, Asher Miller, of Middletown, Ct., whom he employed, June 6, 1799, to remove to the town, and commence improvements. As a consideration, he was allowed the choice of 500 acres, wherever he might select, and at a very reduced rate. Accordingly, in July, Miller opened a road from the river, to near the centre of the town, and fixed his residence and location, near the small lake, about a mile east of Rutland Village. From a memorandum, made by him, we derive the following names of purchasers, during the years 1799, 1800, 1801, from which it will be seen, that the town settled with great rapidity, mostly by emigrants from New England. Nearly all of these men are now dead. The number of acres taken by each is appended. In 1799, Levi Butterfield (September 21, 172; Perley Keyes, Amos Stebbins, and William Keyes (October 3), 343; David Coffeen (November 1), 391; Goldsmith Coffeen, 312; Raphael Porter, 2l3; Israel Wright, 98; Jonathan and Clark Boss, 161; James Killiam, 141; Charles Kelsey, 116; Jeptha King, 137; John Dole, 154; Gardner Cleveland, 242; Warren Foster, 142; John Cotes, 134 (November 6). In 1800, in June, John Earl, Jr., 120: Nathan Green, 128; Robert Jeroms, 145; Isaac and Caleb Corp, 196; in July, Henry Houk, 130; in autumn, John Earl, 134; Danford Earl, 113; Simeon Munson, 89; Mathias Houk, 135; Alford Comins, 94; Charles Comins, 128; Solomon Tuttle, 233; Chauncey Rawson, 122; Gershom Tuttle, 276; Abel Sherman, 229; Kenyon Larkin, 352; Peter Cook, 92; Ezekiel Andres, 144; ___ Rose, ___ Welch, 155; Lot McClure, 72; Isaiah Bailey, 50; Luther Foot, 137; Enos Sanford, 141; Jacob A. Williams, 108; Amos Barnes, 2d, 97; Stephen Kemball, 97; Vernon Huston, 193; Elijah Beech, 80; Thomas Lee, 61; Daniel Russell, 75; Turner Ellis, 160; Joseph Patterson, 122; Silas Pierce, 100; Benjamin White, 53; James Murray, 125; Abner White, 51; Thomas M. Converse, 78; ___ Brayton, ___ Swan, 93; Jonathan Hill, Frederick Tyler, 146; John Stanley, 136; Stephen Cummins, 146; Andrew Stafford, 116; James Stafford, 106; Elisha Ludden, 261; Philip H. Hinman, 269; Thomas Hosmer, 225; Peter Wright, 118; Erastus Maltby, 158; Chandler Maltby, 151; Roger Williams 291; George White, 266; Benjamin Pike, 170; Clift French, 105. In 1801, William Coffeen, 257; Thomas Dunton, 328; John Patterson, 130; Alexander Warner, 74; Joseph Wakefield, 98; Jesse Hale, Asa, and Luther Brown, 100; Josiah Osmer, Luther W. Dexter, 120; Samuel Treadway, 178; Orange Eno, 68; James Morse, 68; Levi Hare, 155; Joseph Underwood, 133; John Smith, 121; David Stafford, 118; Thomas Starkweather, 103; Joseph Luddon, 124; Thomas Hill, 112; Caleb Harris, 114; ___ Scott, ___ Wessel, ____ Johnson, 651; Asher Bull, 247; Ethan Newton, 130; Stukely Wicks, 114; Jonathan Covey, 126; Job Olmstead, 145; ___ Brittan, ___ Foster, 173. Without date, but in one of the above years, Jonathan Davis, 93: Thinyon Green, 110; Charles Hill, 120; Jacob Shook, 70; Ethan Post, 148; Artemas Pike, 135; Samuel Parker, 120. The total amount of sales during the three years was 17, 549.03 acres for $50,738.14, the contracts being without interest for one year. By much the largest part of the town was thus rapidly settled, the unsold portions being along the north and south bounds. In June, 1803, Abel French succeeded as agent, and the same year sold 12,313 acres for $7,112.60. Early in 1804, Henderson assigned to Dr. Isaac Bronson, of Greenfield, Ct., and afterwards of New York, his interest in the town. Dr. Bronson was born in Middlebury, Ct.; when a youth, he studied medicine at Hartford, and at any early age obtained a commission as surgeon on board a merchant ship, and sailed for the East Indies, where, by trade, he amassed wealth. On returning, he embarked in land speculations, and among other things, on the disbandment of the American army, at the close of the Revolutionary war, he purchased soldiers’ scrip at a great discount, which afterwards rose to par. Soon after the purchase of the townships by Dr. Isaac Bronson, he appointed Ethel Bronson, his brother, of Middlebury, Ct., agent, to settle in the town and sell his lands. Previous adventurers had bought back flattering accounts of the country, and New England was filled with the fame of the new and fertile lands of the Black River Country. In May, 1804, Ethel Bronson, David Tyler, and Josiah Tyler, with their families, started for their distant home. Three weeks were consumed in the journey, the latter part of which was difficult and perilous. The roads, lately marked out, and leading through almost uninhabited forests, were hardly passable with teams. Frequent breakage compelled the party to walk, encamp in their wagons, or the most convenient locality, and subsist on whatever was at hand. Fortunately, however, they suffered no want of provisions before they reached their destination. Ethel Bronson settled in the centre of the town; and David and Josiah Tyler, in the southern part; after whom the present village of Tylerville was named. Among the first to settle in this town, were Samuel Porter and family, who experienced many hardships, being obliged to send to Whitesboro to mill, a distance of nearly seventy miles, the journey being performed with an ox team. It is said that straggling Indians infested the settlements when new, and proved annoying, by pilfering, or openly plundering the property of the settlers in the absence of the men at their work. In connection with the perils of the pioneer life, may here, perhaps, not inappropriately be noticed those of one, who, at a later period, lived and died in this town. The events happened at an early period, and at a distant locality, but the account will interest many who are personally acquainted with their heroine. “Mrs. Elizabeth Parkinson, who died in Rutland, June 22, 1842, at the advanced age of eighty-four, was a native of New Hampshire, having married, for her first husband, Mr. Peter Poor, and with him moved to the town of Bethel, situated near the source of the Androscoggin River, in the state of Maine. Here she was residing with her husband and two children in the year 1781; in the autumn of which year the savages came down upon that recent and defenceless (sic) settlement to seek for scalps and plunder. These savages were instigated to maurauding and murderous expeditions by the bounty offered by the British for scalps. They entered the house of Mrs. P., with two of her neighbors already captured and bound, and made enquiry for her husband, who was fortunately absent at the time. After having ate, plundered and rioted as they pleased, they went in quest of Mr. Poor, and without her knowledge found him, and on his refusing to become their prisoner, shot him, and took his scalp in their sacks. Mrs. P. fled from her house with her children, and waded the Androscoggin at as great a depth as she dared, in order to avoid being traced by the Indians, and at night lodged in the forest. Meanwhile, her husband had been discovered and taken up, and in the first house she dared approach, she beheld his mutilated and bloody corpse. This was a heart-rending scene; and yet it was met with Christian fortitude. She was soon composed, and sat down to her Bible, which she had not forgotten to take along with her, and opened the 46th Psalm, and when she came to the 10th verse she responded in her heart, “I will be still.” She buried her husband, then took her children with her upon a horse and started for her friends. The road was, at best, only a footpath, winding through a dense forest, over hills and across bridgeless streams. The journey was made as fast as possible by day, and through the night she composed herself as well as she could, being compelled to lodge upon the ground with no covering but the dense branches of the woods. There were beasts of prey to seek her life, and none to preserve and defend her but her Maker. These facts were taken from an extended obituary notice, published in the New-York Observer, December 10, 1842. The first child born in the town of Rutland, among the families of settlers, was in the family of Charles Kelsey. The first school was taught by Miss A. Porter, in 1803. The early incidents of this town do not possess sufficient interest to particularize from those in the country, generally. In the newly settled district embraced in townships 2 and 3, the men were mostly in the prime of life, fond of athletic games, and, at their gatherings, would often indulge in amusements that are now nearly obsolete. Among these, wrestling at “square hold,” was esteemed as a sport that afforded the fairest test of personal strength and agility, and a successful wrestler would, in those days, acquire distinction wholly unknown at present. On a certain occasion, about 1803, a bet had been made by a No. 1 man, “that his town (Rutland) could throw every thing in No. 2” (Watertown), and as this challenge was too direct to be evaded, about a hundred men assembled, by appointment, at G. Tuttle’s, in the edge of Rutland, to settle the question, the victors, besides the consolation of beating their adversaries, being promised all they could eat and drink. After various preliminaries and much discussion, it was agreed that each town should choose a man, and that they would abide by the result of this single contest. David Coffeen was chosen by No. 3, and Turner by No. 2, but after a long trial neither succeeded, and night put an end to the contest. The parties separated, with the agreement that they should settle the question when they next met, which accidentally happened some days after, and the question of supremacy was decided in favor of Rutland. During the war, a company of Silver Grays, consisting of about forty, mostly revolutionary soldiers, whose age exempted them from militia service, was organized under Timothy Tamblin as captain, and Levi Butterfield as lieutanant. They were at Sackets Harbor for several weeks, and erected near the site of Madson Barracks, a defence, which was named Fort Volunteer. Judge Ethel Bronson continued in the agency of his brother’s estates in this county till his death in 1825, and in September, Major George White, an active and prominent citizen, who had lived in town almost since its first settlement, was appointed, and continued till the lands were sold, and accounts settled with the proprietor. On the 13th of April, 1846, the last of the lands were sold, it being an island near the village of Black River. Most of the settlers enumerated in the previous list, came in and commenced improvements immediately. Dr. Hugh Henderson was the first physician; the first death was the wife of Francis Towne. The first inn was kept by Levi Butterfield, near the centre of the town, at what is now generally called Rutland Village. The county map of Burr gives the name of this place as Brookville, from Curtis G. Brooks, an early and prominent settler, but it has never been known by this among the inhabitants. The first grist will in town, and in the county, was erected in 1800 by David Coffeen, who had received a gift of ten acres (to be confirmed when the mill was finished) at the present village of Felt’s Mills, and on Mill Creek near its mouth. This primitive mill was indeed rude (sic) and humble, but very useful for the settlements throughout the county. It was got in operation in March 1801, and was resorted to from great distances. The millwright was Samuel Parker, but the first pair of mill stones was made from boulders of gneiss, found in the vicinity. This mill opened a new era in the business of milling, which had been previously accomplished by pounding in stump mortars rudely scooped out. This was the first improvement in this place, and the next season a saw mill was erected. Coffeen, subsequently sold to Wolcott Hubbel, and the latter to Barnabas Eldridge. The property passed from him to Barnabas La Grange, and in 1813, to John Felt, from whom the place derives its present name. In 1808, a bridge was built to the Island, and soon after another to the north bank, which was swept off in 1811. In 1821, a dam was built across Black River, and the present stone grist mill was erected the year after. In 1823-4, a saw mill was built on the island, and in 1842 another and larger one lower done (sic), since which time a very extensive business of lumbering has been carried on at this place, from two to three millions of feet of pine having been sent to market annually. The Pine Plains which are immediately adjacent on the north bank of the river furnished for many years the logs for supplying these mills, but this source having been mostly exhausted, they are now principally derived from the forests in the eastern part of Lewis County, being floated down in the spring flood. This business at this place may be said to have nearly ended. Felt’s Mills is a place of considerable business, having besides three saw mills, a grist mill, and a variety of manufacturing establishments with water power, an inn, several stores, a Union Church, and about fifty dwellings. The church belongs to Methodists, Baptists, and Universalists, and was erected in 1848. This place is by plank road eight mills from Watertown and two from the Great Bend. By an act of April 1st, 1841, the island at Felt’s Mills was taken from Le Ray, and annexed to Rutland. The Felt’s Mills Burial Ground Association was formed March 29th, 1852, with Oliver A. Tooker, Henry W. Chapman, Elijah Graves, Samuel Felt, Hugh Roberts, and Joshua Roberts, trustees. Tylerville (East Rutland P. O. ), is situated in a narrow valley, on Sandy Creek, and at an early day it acquired some importance from its being the seat of a small woolen factory, that was erected by The Rutland Woolen Manufacturing Company, formed September 25th, 1811, with a capital of $25,000, and the following parties as signers of the articles, the first three being trustees. Ethel Bronson, Daniel Eames, Josiah Tyler, Thomas Hill, Abel Doolittle, Eber Ingalsbe, and John Oaks. The first settlement at this place began in the spring of 1805, by Erastus Lathrop and Nathaniel Frink, from Norway, N. Y., the former of whom erected a grist mill, and the latter a saw mill. Josiah and Frederick Tyler were early settlers, and from them the village derives its name. Joel Webb, Abel Doolittle, and others settled here at an early period. The woolen factory established here was the first in the county. A building for carding and spinning by water, and another for hand looms were built at this place in 1812, and got in operation during the following winter. High prices were necessarily paid for wool, which embarrassed their operations, and on the 13th of April, 1814, an act was passed allowing $5,000 to be loaned from the state treasury to Ethel Bronson, in behalf of the company, security being given. September 19, 1817, the machinery was sold at auction to Daniel Eames for $400, and it has since been used as a cloth dressing works, until within ten years. About eighty per cent of stock was paid in, and most of those concerned lost money in the business. Since the discontinuance of these operations the place has not grown, and it has but about thirty families. Black River village and post office, locally known as Lockport, is situated two and a half miles below Felt’s Mills, on both sides of Black River, in Rutland and Le Ray. Improvements commenced here in 1806, by the erection of a saw mill by Isaac and Harvey Cleveland. The mill being destroyed by the flood of 1807, was rebuilt the same season. There was at this place, in 1818, but one house. About 1815, Andrew Middleton and Christopher Poor erected a mill at some distance below the present village, where a branch of Black River issues from a subterranean passage, and affords a mill privilege. About 1810 there was erected a grist mill, and the place being one that affords an extraordinary amount of water power, has become the centre of considerable business, having at present three saw mills, a grist mill, two butter tub factories, a chair factory, a tannery, two shingle factories, a wagon shop, a machine shop, two inns, &c. There are several very available, but at present unoccupied water privileges on Black River, the whole of which could be repeatedly used below the village. This town deserves honorable mention, for the interest that has been manifested in supporting district schools. In 1836, school district No. 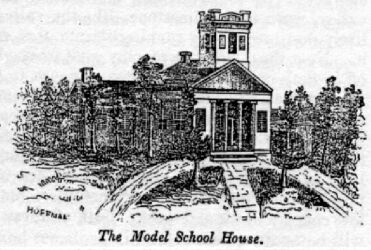 4, erected on a road between the middle and south roads, the elegant school house represented in the accompanying engraving, at a cost of about $1,000. The project was originated and mostly sustained by Moses Eames, Cliff Eames, Gardner Towne, Alexander Warner, Horace Tyler, and B. F. Hunt, who were subsequently joined by H. Hopkins. This district has found it for their interest to employ well qualified teachers, and the school has for several years been under the supervision of Miss C. M. Johnson (a graduate of the State Normal School), to whom it owes much of its popularity. The trustees have also taken care to provide apparatus, and all those appendages that tend to the promotion of health, comfort, and mental improvement of scholars. The example has been followed by several other districts, and has excited an emulation in the highest degree beneficial. The reputation of these schools has drawn students from a distance, and the enlightened policy with which they have been conducted is worthy of general imitation. Rutland is one of the best dairying towns in the county, if not in the state. It is situated on the summit of the Trenton limestone formation, and although to one entering it from Watertown, it appears elevated, it is less so than the country further east and south, and one cause of its peculiar fitness for grazing is, doubtless, in the abundance and excellence of its springs of water. From the brow of the hills that overlook the country north and west, to great distances, the most magnificent prospect is presented, the country below being quite level, in one direction bounded by the lake, and in the other it extends off towards St. Lawrence County, until lost in the distance. The traces of ancient works which this town affords, indicate that it was formerly inhabited by the native Indians in considerable numbers, but their cabins had nearly or quite disappeared from this, in common with most other parts of the county, before the present settlements commenced. There are several deeply interesting geological features in this town, which are due to the latest, and, indeed, almost the last, of the agencies which have modified the earth’s surface. Across the northern part of the town, nearly parallel with Black River, and about two miles distant, is Rutland Hollow, a remarkable valley, worn in the limestone, like the valley of a river, but entirely destitute of any running stream that could have produced it. Near the middle is a marshy spot, from which the water flows off in both directions, and then appears to be continued across Watertown, Houndsfield, Adams, and Henderson, to the lake, although in some places interrupted, and scarcely perceptible. Along the edge of the terrace of limestone which underlies the town, and at an elevation of nearly four hundred feet above the lake, is distinctly to be observed the trace of an ancient beach, proving that the lake once washed these buffs, and covered the low country north and west. Both of these features in geology will be again noticed. Near the south-west border of this town, are the Burrville Cascades, which consist of four separate falls, leaping into one basin, from the elevated table land above. The first two descend a perpendicular distance of forty-five feet, and the last two a distance of twenty to thirty feet, by a gradual descent, over shelving limestone rock. These streams, uniting at this point, form the North Sandy Creek. Standing at the foot of the fall, the semicircular basin, fringed with foliage of varied hues, and resounding with the music of the waterfalls, the scene in summer is one of surpassing loveliness, and when swollen by spring floods, one of singular grandeur. The spot is much resorted to, and is said by tourists to excel, in quite, yet majestic beauty, any scenery in the state. It is narrated that a Mr. Lampson fell from the top of the highest fall to the bottom, and escaped uninjured. The Rutland Farmers’ Library was incorporated Nov. 11, 1806, the first trustees being, Ethel Bronson, Hugh Henderson, Abel Sherman, Daniel Eames, and Curtis Mallory. Religious Societies.--Meetings for religious worship were first held at the house of Raphael Porter. 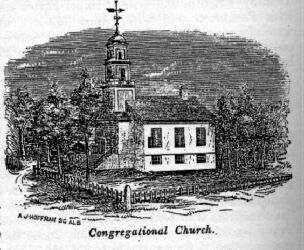 The first Congregational church was organized Jan. 12, 1808, by the Rev. ___Lathrop, a missionary, from Vermont, consisting of ten members, viz., David Tyler, Amos Mallory, Thomas Converse and wife, Timothy Tamblin and wife, Samuel Porter and wife, and William Parkinson and wife, Amos Mallory and David Tyler were afterwards chosen deacons. The whole number received as communications up to Nov. 6, 1853, has been 320; present number 100. The First Religious Society of Rutland was formed Feb. *, 1808, and Ethel Bronson, Timothy Tamblin, John Read, Thomas Converse, and Ebenezer Hayward, were elected trustees. It may be mentioned as indicative of the strict Puritanism of the early fathers of the church, that Amos Mallory was objected to for the office of deacon, on account of not having a wife; a deficiency which is contrary to the letter of the law. We are not informed whether they required him to qualify for the office by complying with the scriptural advice on this subject. The first prudential committee was formed Oct. 26, 1815, consisting of David Tyler, Amos Mallory, Ethel Bronson, Jonas Bronson, Levi Hall, and Rev. Daniel Banks, the latter of whom became the first pastor, and was ordained over this church and that of Watertown, October 26, 1815. Previous to him, the clergy had been, the Rev. Messrs. ___ Lathrop, 1808, Enos Bliss, 1810, ___Leavenworth, 1813. On the 20th of Jan., 1824, the Rev. Adams W. Platt was ordained, and remained till July, 1829, when he dissolved his connection with the church. On the 24th of February, 1824, the church numbered 87 members, the total up to that time having been 116, of whom 23 had united by letter, and 77 by profession. Of the latter, 30 joined in 1817, and 18 in 1822-3. On the 22d of December, 1823, it was resolved to unite with the Presbytery, retaining the former plan of government, but placing themselves under their watch and care. This was done Jan. 20, 1824. In 1835, July 5, the Rev. David Spear was employed for a stated time; in 1838, Rev. ___Morton; and in 1839 the Rev. J. H. Rice. On the 25th of November, 1841, the Rev. Hiram Doane was installed over the church. Rev. James Douglas was in September, 1850, employed for one year, at the end of which time he left to fill a professorship to which he had been promoted in Genesee College, Lima, N. Y. In his absence, the Rev. Henry Budge was employed for one year, and in May, 1853, Prof. James Douglass, having resigned his chair as professor, received a unanimous call from the church and society to become their pastor, and in September, of the same year, was ordained and installed over the church. For a series of years, meetings were held in a school house, until the first church was erected in 1819, opposite the residence of Henry Hopkins. The old site was exchanged for a new one, upon which the present edifice was erected, in 1841. It has a bell, a good instrument for the choir, and an ample session room in the basement. There is a flourishing sabbath school connected with the church, numbering about 100 scholars, and a library of 500 volumes. The Ladies’ Sewing Circle contributes about $50 per year to charitable purposes, and contributions to other benevolent objects, during the past year, have amounted to $150. We are indebted to Mr. Charles Hopkins, of Yale College, for most of the above statistics. The Baptist Society of South Rutland was formed November 11, 1833, James Brown, Steven Brainard, and Milo Maltby, trustees. This society, in concert with the Methodists and Universalists, in 1843 erected a union church, the only one in the village of Tylerville. A Baptist church was formed at Lockport, in 1837, and the next year joined the association and reported thirty-nine members. It never had a meeting house, and has ceased to report. The Methodists erected, several years since, a church in Rutland Hollow, but we have not been able to procure its statistics. The Methodist Episcopal Society of Black River was formed April 9, 1845, with Thomas H. Scott, Bildad Woodward, Henry Scott, William P. Treadway, and David Dexter, trustees.